Sberbank is Russia’s largest bank and the backbone of Russia’s economy, accounting for one-third of its banking assets. Over 325,000 Sberbank employees serve more than 145 million individual customers and 1.8 million corporate clients across 22 countries. Sberbank boasts the widest-reaching distribution network of services with over 16,000 branches in Russia and operations in Commonwealth of Independent States (CIS), Central and Eastern Europe, Turkey, UK, USA and India. Given its 175-year longevity, Sberbank has been proactively responding to the challenges of today’s global competitive landscape. In recent years, Sberbank has pursued an ambitious business transformation programme to build a digital ecosystem for its clients. The Bank is currently creating an integrated marketplace of products beyond traditional financial services, spanning from lifestyle, real estate and healthcare to telecom, e-commerce and B2B services. Today, a deep understanding of client needs is what distinguishes a true market leader from an ordinary company. 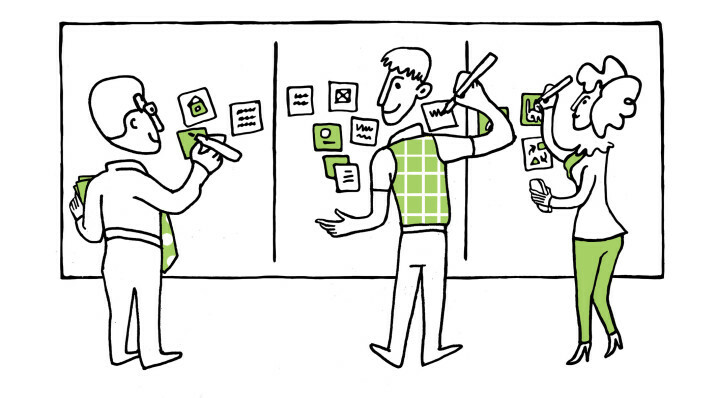 Employing a human-centered approach to creating breakthrough solutions, design thinking is a great enabler for Sberbank’s innovations-focused development. Today, competition is not too often waged over products, but rather centers on the ability to timely and accurately understand client needs. This is why Sberbank is prioritizing client satisfaction, best-in-market customer experience, and continuous and rapid product and service improvements through innovation and minimum time-to-market. This shift from a traditional financial institution to a human-centered innovator is impossible without major changes inside the company. One of the initial adjustments for this transformation to occur is to achieve a mindset shift among staff to embrace the essential importance of client needs, experimentation, fast prototyping, collaboration, creativity, problem solving, system thinking, Agile and so on. Design thinking was chosen as one of the instruments to drive the implementation of Sberbank’s new strategy and help its transformation into a financial industry trendsetter. This methodology has proven its efficacy in its human-centered approach to developing creative innovative solutions that truly meet the needs of clients. Moreover, the key principles that underpins the philosophy of design thinking are reflected in the Bank’s core values: I am a Leader, We are a Team, All for the Customer. Sberbank’s employees are being “reprogrammed” both on the job and with the help of the Bank’s core educational hub – Sberbank Corporate University (SCU). Working together with Stanford’s d.School, SCU launched its flagship programme, Design Thinking: from Insights to Innovation in 2013. After the rollout of the programme, it became apparent that further expertsupport was required to foster the implementation of design thinking outside of the SCU classroom. With this in mind, SCU initiated a collaboration project with INEX Partners - an organization of recognized design thinking pioneers in Russia - to create a handbook outlining the practical methodology of using design thinking to transform client service experiences. 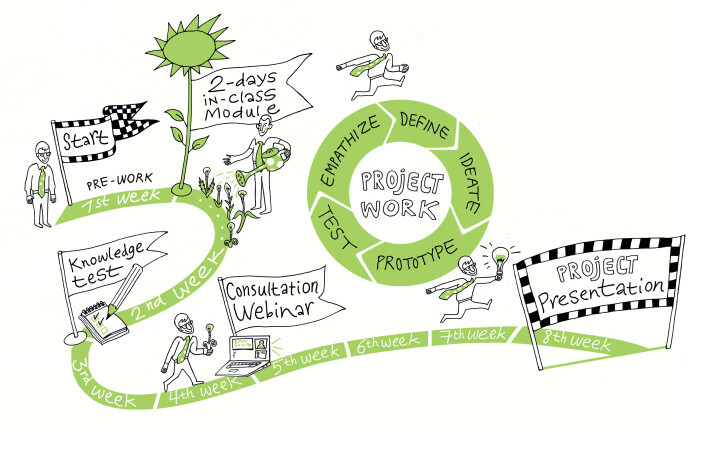 SCU’s Design Thinking Programme is aimed at middle-career managers at the Bank. It covers practical classroom-based training and on-the-job projects, which the participants complete after finalizing the programme. While the overall approach has remained broadly the same since 2013, there have been significant milestones in the evolution of the programme. When the programme was first rolled out, it was taught by a team of Stanford-certified inhouse trainers, who had used the methodology on actual projects and could provide practical advice to budding design thinkers at the Bank. At the same time, there was a clear need for structured reference materials to support the learning process. And so, the idea to create a design thinking handbook was born. A team of SCU and INEX experts had one month to develop the content, conceptualise the visuals, agree on the book design and get the book ready for print. It seemed only logical to apply the design thinking methodology to the task at hand. Thus, early prototyping enabled fruitful ideation, generating 80% of the ideas for the book content. Thereafter, an iterative approach to refining the text and illustrations allowed the team to meet the project deadlines and deliver a high-quality result. The handbook Design Thinking: Let’s Think Differently provides an easy-to-understand toolkit for each stage of the design thinking process, derived from existing projects both within the Bank and elsewhere in other industries. The book has become a key resource to guide the learning process. 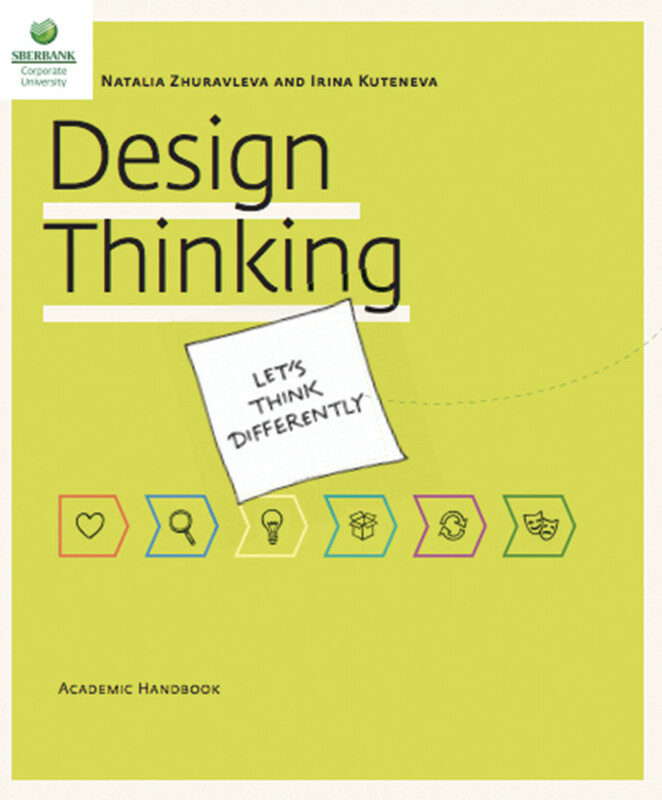 To support the rollout of design thinking to the Bank’s overseas subsidiaries, the book was translated into English in 2015 and into Turkish in 2016. Over time, the popularity of SCU’s Design Thinking Programme continued to grow. It soon became apparent that the existing pool of in-house trainers was insufficient to meet the surging demand for training, and therefore, SCU called upon INEX Partners to step in as instructors on the programme. Moreover, there was a need to reconsider the approach to participants’ personal projects. 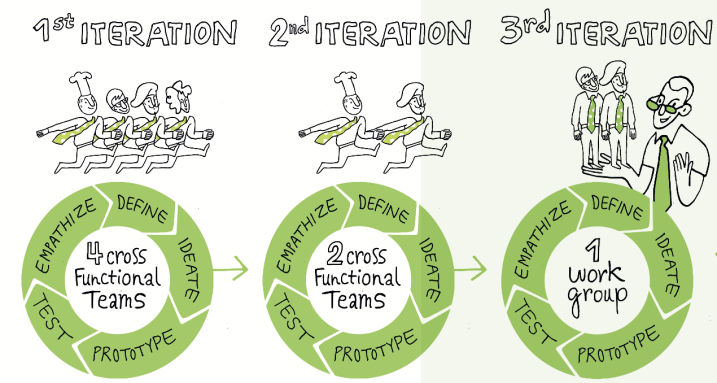 Completion of actual on-the-job tasks using the design thinking methodology is instrumental to cementing participants’ newly formed skills and enabling knowledge transfer to their teams. However, until 2016, these projects were presented solely in writing, without the opportunity for dialogue and direct feedback and clarification from instructors, which often meant that many significant nuances were lost. As a result, the programme was restructured to introduce two webinars following the completion of classroom-based training: the first was conducted four weeks into the project and enabled participants to get pointers that would steer their projects in the right direction, and the second was administered eight weeks after the classroom-based training, where participants presented their project results. Given the continued growth of demand for the Design Thinking Programme, a dedicated Design Thinking School (DTS) was established at SCU in 2016. One of the key priorities for DTS has been to nurture and grow the pool of in-house design thinking trainers – a group of forwardthinking leaders who could inspire their colleagues to integrate design thinking into their daily work. DTS drew on INEX Partners’ significant industry expertise to develop a comprehensive certification programme for new trainers. During a two-day classroom-based session, INEX experts give participants the tools to be programme instructors and inspire them to be client-centric in their work. After this, INEX also provides coaching to newly minted trainers as they take their first steps in facilitating and presenting Design Thinking Programmes at SCU. As industry understanding and awareness of the methodology grew, so did the application of design thinking on projects at the Bank. The Retail Solutions division began to implement a client-centric business development model, actively applying design thinking principles in their projects through the introduction of a dedicated Design Thinking Laboratory. Olga Linnik, the head of the Design Thinking Laboratory within Retail Solutions, describes the challenge thus: “We were asked to instill design thinking into employees’ DNA. To make the spirit, methods and ways of design thinking not just a bit of fun and games, but a part of real business practice.” – In 2016, INEX joined this Retail Solutions project to oversee a series of pilots and help make the initiative a success. After several iterations, the final project focused on gaining an understanding of the needs of project participants, project leads and business sponsors through customer/employee journey maps. In collaboration with INEX, qualitative, empathic interviews and prototypes of business processes and physical spaces helped the Retail Solutions division develop service models and engage participants from across the business. The development of project leader, team member and facilitator guidelines to help overcome practical obstacles that teams are likely to encounter in their projects. 1. The Design Thinking Programme is one of SCU’s top 5 programmes with a satisfaction score of 9.2/10. It is a highly sought-after instrument for developing key competencies among Sberbank staff, with over 1,500 graduates to date. Moreover, the programme has been delivered to a number of Sberbank’s strategic partners, helping to consolidate existing relationships and build Sberbank’s reputation as a thought leader. 2. The success of Design Thinking: Let’s Think Differently handbook has surpassed all expectations, with 7,000 copies printed since 2013. Given the popularity of the book, in 2016, it was made available for sale to the general public. 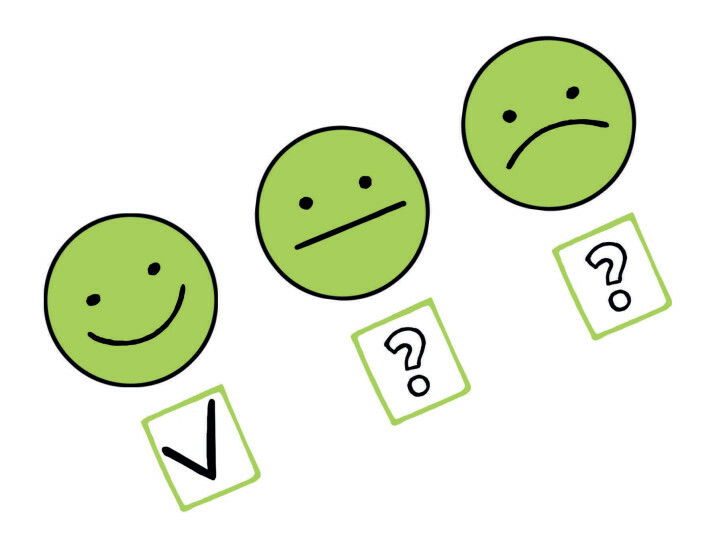 A project to redesign the experience of Sberbank’s credit card customers used a Customer Journey Map/Blueprint to identify service gaps that created a negative customer experience. The findings prompted the development of a debt reminder SMS service. Within the first month of the service’s launch, Sberbank had seen a 15% drop in the number of client enquiries about outstanding debt. To alleviate some of the other issues identified through the Journey Map, the team also developed a new card issue process. After several iterations of prototyping and testing, the revamped process will be piloted with 10,000 internal users in the near future. By gaining a better understanding of the communication pain points, the project team simplified the way that information was presented. Having removed unnecessary banking jargon, the team enabled customers to discover all relevantinformation about the credit card usage, alleviating the main problems on the Sberbank website. Another project to redesign client experience with call centre interactive voice menus led to a dramatic overhaul of the underlying traditional architecture and framing. As a result, the entire client interaction process with the voice menu has been transformed, leading to a 25% reduction in the average time customers spend in the voice menu during their call and a threefold reduction in the number of people who have been unable to find the required menu option. 1. 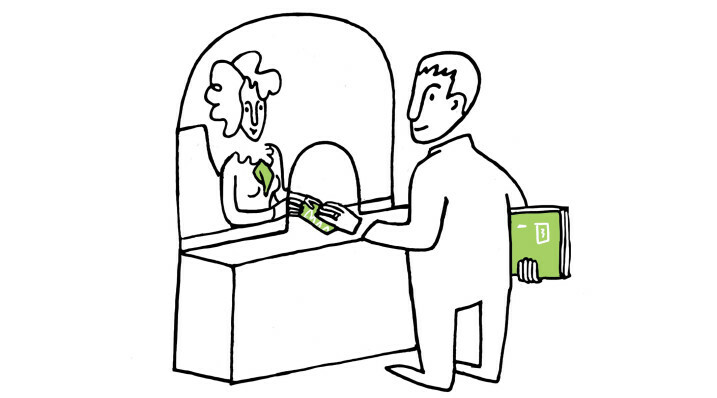 The SCU is helping to transform Sberbank. New educational technologies are helping to inspire leaders inside the bank to develop new products. In the words of Yulia Konovalova, head of the SCU DTS, “we are always introducing new formats and innovative educational technologies. At the end of 2016 we developed empathy simulations using virtual reality to help programme participants immerse themselves in another person’s world – for example, that of an elderly person or a person with disabilities. This in turn helps them better prepare for interviews with different users in the field.”. Inspiration also comes through new formats, such as the introduction of micro-learning, where content is pushed out every day in small increments. By the end of 2017, the DTS is going to publish a compendium of designthinking mini-cases to show how design thinking has helped to deliver outstanding solutions at Sberbank. 2. Every leader who completes the SCU training can disseminate the design thinking philosophy to their teams. Such an organic expansion of the design thinking approach is helping to transform the culture at Sberbank in tangible ways. Firstly, the language used inside the company is changing. The client-centric approach at the heart of design thinking is helping employees move away from customary bank jargon and think in terms that make sense to end users. Secondly, attitudes to design thinking itself are shifting. When the Design Thinking Laboratory was first created, very few people wanted to get involved in design thinking projects, citing time shortages. These days, the Laboratory is inundated with project requests. In 2016, the Laboratory helped to deliver 30 projects, which involved 150 team members and more 1500 clients. 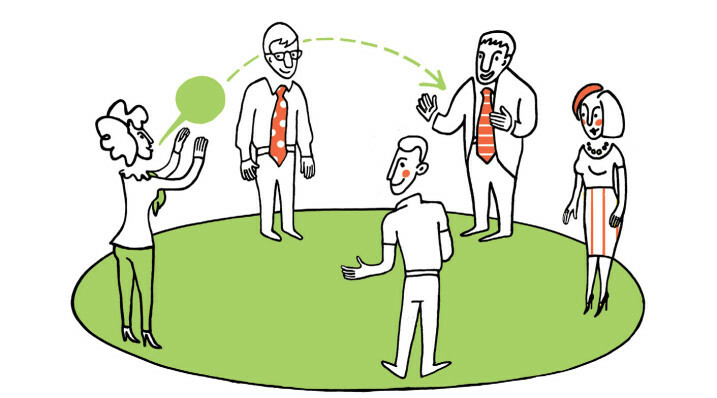 There is an emerging community of Sberbank staff with expertise in developing client-centric solutions. Their passion for the topic is so great, that they continue to exchange ideas outside of work hours through various communities on social media. Design thinking projects have given a greater sense of freedom and empowerment to Sberbank employees, imparted a growing sense of pride in their work and enabled considerable cross-functional collaboration. “One might think that IT is a strict system, but it was great to see people come up with new ideas even within these constraints. Product changes were easier when the project team brings together all departments that are involved in selling and using the products and services,” says Igor Kovalev, executive director and department head within Retail Solutions. To reinforce these changes and drive the integration of design thinking into the fabric of its operations, the Bank’s latest competency model now includes a formal requirement to use the design thinking methodology on an everyday basis.